Clinical significance: Helicobacter pylori is a gram-negative microaerophilic curved bacillus with an affinity for human gastric mucosa. H. Pylori has been identified as an important pathogen in the upper gi tract. The casual relationship between h. Pylori and chronic active gastritis, duodenal ulcers, and gastric ulcers has been well documented. Breathtek™ UBiT® for h. Pylori is a non-invasive, non-radioactive method for detecting urease activity associated with h. Pylori infection. It is fda approved to confirm cure and offers 95.2% sensitivity and 89.7% specificity compared with endoscopic methods. This Clinical Focus provides information on Helicobacter pylori infection, focusing on the selection and interpretation of laboratory tests for diagnosis and assessing treatment response. Preferred Specimen: Human breath: paired breath samples (pre and post) collected in breathtek(tm) ubt collection kit bags and must be submitted together. Follow instructions provided with kit. The test can only be performed on specimens from patients greater than 3 years old. For patients 3-17 years of age: gender, height, weight, and age, must be provided on the pediatric uhr card included in the BreathTek® UBT collection kit. For administration by a health care professional only. Do not provide this kit to the patient for self-administration. Verify that the patient has been prepared for the test. Open the BreathTek UBT Kit, which should contain all the materials. Label each breath collection bag to maintain patient identification using the bar-code labels provided, or according to your laboratory or office procedure. Pick up the blue breath collection bag. Remove the pull-off cap from the mouthpiece of the breath collection bag. Replace the cap firmly until it clicks on the mouthpiece of the bag. Prepare the Pranactin-Citric solution no more than 60 minutes before administering it to the patient. Urea slowly decomposes in water. Pick up the Pranactin-Citric pouch. Tap the upright packet of Pranactin-Citric to settle the contents in the bottom half. Tear off the top of the packet and carefully empty the contents into the drinking cup provided, making sure to transfer all of the contents by tapping on the bottom of the pouch. 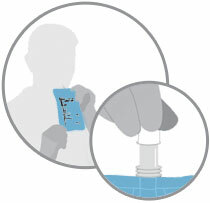 Add drinking water to the fill line indicated on the outside of the cup by a raised plastic ridge. Replace the lid securely and swirl the mixture for up to 2 minutes to dissolve the packet contents; typically, only 1 minute is required for complete dissolution. The resulting drug solution should be clear with no particulate matter. If particulate matter is present after thorough mixing, the drug solution should not be used. Instruct the patient, including pediatric patients aged 3-17 regardless of age and body weight, to drink all of the drug solution with the straw provided, without stopping. Advise the patient NOT to ‘rinse’ the inside of his/her mouth with the drug solution before swallowing. Discard the straw after the patient has finished drinking the drug solution. Wait 15 minutes. 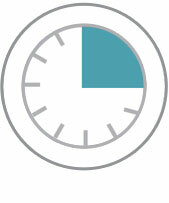 The patient should sit quietly and should not eat, drink or smoke during the 15 minute interval. 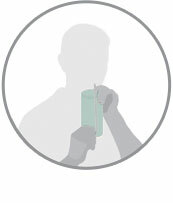 Collect the second breath sample in the pink bag using the same procedure as Step 1. Place cap on the bag and press down until it snaps to prevent sample loss. Samples are good for 7 days, at room temperature, after collection. Study design: A multicenter, open-label study. The primary endpoint analysis was conducted to determine the sensitivity and specificity of the BreathTek UBT UHR to the composite reference method criteria for the 176 evaluable cases. The table demonstrates the diagnostic performance of the BreathTek UBT (expressed as UHR) compared to the composite reference method criteria in pediatric patients ages 3 to 17 years. Transport container: Tightly capped blue and pink bags. Bags may leak if cap is not attached. Keep each pair of breath samples together reusing the plastic kit pouch provided. Transport Instructions: When shipping breath sample bags from pediatric patients to a laboratory for analysis, complete the pediatric UHR card by entering collection date, patient ID, gender, age, height and weight. Place the completed card inside the sample transport bag along with the collected breath samples and the laboratory’s test requisition form. Reject specimen types other than Breathtek UBT bags.